The use of brushless variable turbines reduces the weight of the VP6 units by almost 50% over conventional sound boxes with side-channel blowers. 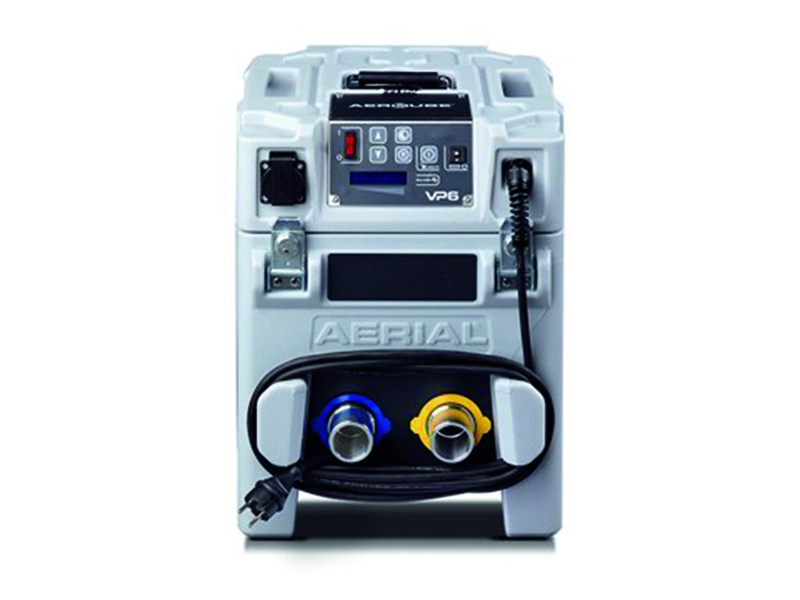 The VP6 unit’s multistage control allows the required performance to be set precisely. Zoe INTL mobile drying range has dehumidifiers to suit every application whatever size or demand. The groups professional restoration series consists of the efficient and stylish Zoe INTL CDT dehumidifiers. They offer quick and easy control for both damage service companies and the building industry. The CDT units are renowned for their user-friendliness, great digital control and light yet robust design. Damage control in case of flooding, burst water pipes or as a side-effect from fire fighting requires fast and efficient dehumidification. This is why damage service companies all over the world prefer the Zoe INTL CDT range of mobile dehumidifiers for the job. They are fast and energy efficient. They offer precise digital settings, service information, easy fault-finding and exact specification of hour and energy consumption as well as readings of temperature and relative humidity. On top of this they are designed for optimal transport and handling. All units in Zoe INTL CDT range are condensation dehumidifiers. An integral fan draws humid air into the dehumidifier and passes it through an evaporator. When the warm humid air meets the cold surface of the evaporator it condenses into water which is led to the water container. In the process the dry air is heated and returned to the room. The repeated circulation of air through the unit reduces the relative humidity, giving very rapid but gentle drying. The CDT units have been carefully designed for easy handling and transport. Adjustable and fixed handles ensure safe and convenient handling and operation. Big rubber wheels make the CDT’s easy to move both up and down stairs and across seemingly impassable areas. The wheels are in line with the sides of the unit to make it as narrow as possible and to protect doors and panels from unnecessary knocks. During transport and storing the CDT units can be stacked requiring as little space as possible. As well as Zoe INTL and Calorex mobile products we can also offer Master units for rental and general purpose drying. These units come in a range of styles and sizes and are a great addition to the groups range. Zoe INTL manufacture portable dehumidifiers in a range of sizes to suit any space. Whatever you need, Zoe INTL, Calorex, Aerial and Master have the solution. All products are supported by an in-house applications department and nationwide service network. Zoe INTL mobile product range has every heating, drying, cooling and ventilation solution to suit every application whatever size or demand. ​Master products are used widely in the construction industry with their professional oil and gas fired air heaters an essential item to be on any construction site whether indoors or outdoors. As well as the heating products Zoe INTL has a vast range of mobile dehumidifiers ideal for the construction market. A very important issue when selecting the device is the ability to use it in difficult conditions, which means it has to be highly efficient and of durable construction. Our products are extremely mobile and cost effective to run. They are considered as basic equipment for construction businesses, rentals as well as for smaller finishing teams and individual fitters. Apart from the basic function of heaters – raising ambient temperature, the device allows the workforce to continue working even in very low temperatures, they also allow to speed up various processes. ​We can offer ready-made solutions for mobile heating and cooling on construction sites, and robust and hard wearing dehumidifiers for all types of building drying. Zoe INTL manufacture mobile dehumidifiers, heaters, air-conditioners and coolers and air movers in a range of sizes to suit any space. Whatever you need, Zoe INTL, Calorex, Aerial and Master have the answer to your climate control issue.